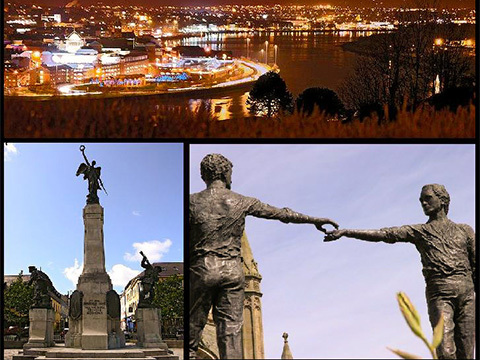 Derry has an extremely long history, the earliest references dating back to the sixth century when a monastery was founded by Saint Columba/Colmcille in 546AD. 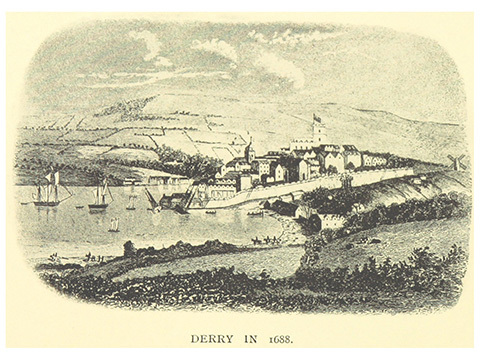 The name Derry changed to Londonderry during the Plantation of Ulster, as the new city was built by the Guilds of London (1613-1618). The cathedral dominates the skyline from its prominent position inside the City Walls. It was the first of its kind to be built after the Reformation in 1633 by William Parrot in a Planter Gothic style for the Honourable The Irish Society. The cathedral is the city’s most historic building containing artifacts from the Siege as well as information on famous personalities like the Earl Bishop of Downhill. It is dedicated to St Columb, the Ulster monk who established a Christian settlement here in the 6th Century.It is built from local stone and has as its foundation stone (in the porch) a stone dating back to 12th Century to the Templemore Monastery of the Columbian tradition. The peal of eight bells in the oldest in Ireland, presented by Charles I in 1638. Restoration was carried out from February 2010 and was completed in June 2011. The Cathedral is fully re-opened and tours have re-summed. 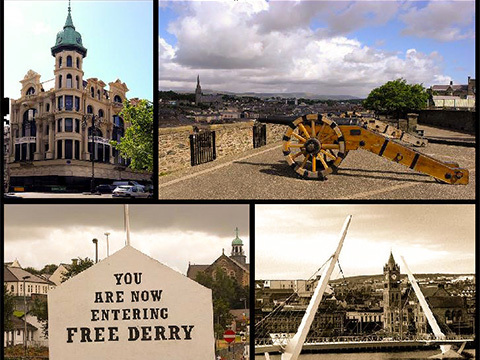 Derry is the only completely remaining walled city in Ireland and one of the finest examples of a walled city in Europe. The walls were built during the period 1613 to 1618 by the Honourable The Irish Society. This was an organisation formed by Royal charter, comprising Livery companies of the City of London to fund the Plantation and the creation of the new city. The walls were constructed as defences for early seventeenth century settlers from England and Scotland. The walls are approximately 1.5km in circumference. They form a walkway around the inner city, a unique promenade for viewing the layout of the original town which still preserves its Renaissance style street plan to this day. The four original gates to the walled city are Bishop’s Gate, Ferryquay Gate, Butcher Gate, and Shipquay gate. Three further gates were added later. The walls vary in width between 12 and 35 feet. The city claims Europe’s largest collection of cannons. In 2005, the surviving 24 cannons were restored under expert supervision by skilled craftsmen. They are displayed throughout the city walls. The Guildhall is located in the heart of the city but just outside the city’s walls. It was built in 1887 in a neo-Gothic style financed by the Honourable The Irish Society and named in honour of the London Guilds for financing the new city almost 300 years earlier. It cost £19000 to build. Then in 1908, it was badly damaged by fire.The whole building had to be renovated and rebuilt, re-opening again in 1912. It was often a target during the Troubles. In 1972 it was again destroyed by a number of bomb attacks. It was carefully restored and re-opened in 1978. The interior houses some of the finest examples of stained glass windows in Ireland, with many being restored by using the original watercolour designs. Other spectacular features are the ornate ceilings, oak panelling, a magnificent concert organ and the four-faced clock tower. 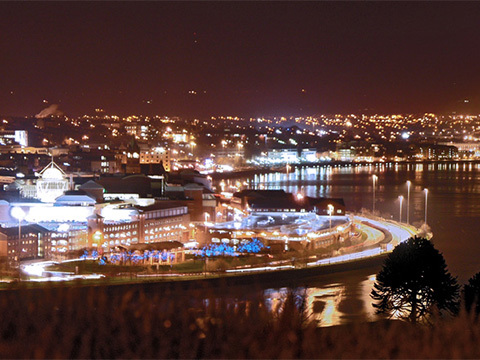 The council chamber on the ground floor is the seat of Derry City Council. This museum captures the emergence of the civil rights movement in 1968 which was a cross-community movement set up to challenge Unionist gerrymandering and limiting of Catholic families’ housing entitlements.The museum has an archive of 25000 individual items relating to the city’s history from the 1960’s. Most items were donated by local residents. 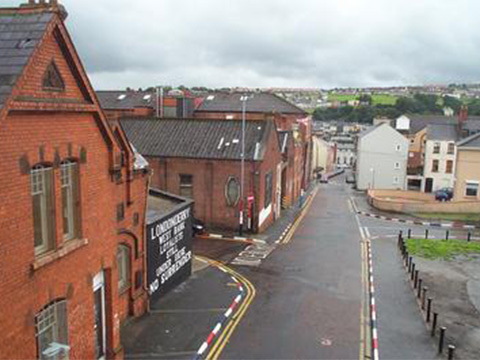 Exhibitions depict the harsh conditions of poverty and destitution suffered by Derry’s citizens in Victorian Ireland. During the Great Irish Famine from 1840-1849, entering the workhouse was the only chance of survival for many people. 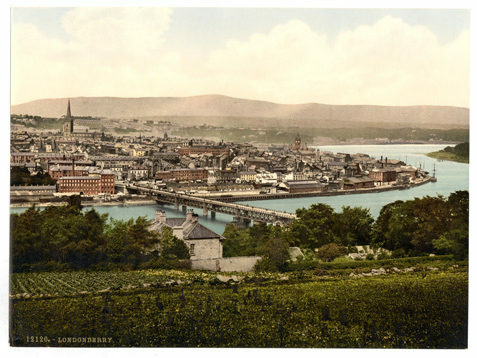 There are many walking tours, cultural and historic that tell the story of the key periods in the city’s history including the Siege of Derry, Emigration, The Great Famine, shirt industry, World War I and II, Easter Rising, Civil Rights Marches, Bloody Sunday, the Ceasefires and the Good Friday Agreement all of which have contributed to shape the identity of the city and its people. Visitors have the choice of a tour by foot, open top bus, taxi or river cruise. This museum plays tribute to Amelia Earhart, the first woman to fly solo across the Atlantic Ocean setting many aviation records. In her solo transatlantic flight in 1932, she made an unexpected landing in a field in Culmore, a townland outside the city of Derry. When a farm worker asked her “Have you flown far?” she replied “From America”. The mysterious circumstances surrounding her disappearance five years later in another pioneering flight continues to fuel speculation as to the exact cause of her presumed death, thus keeping her legend alive. The museum occupies this site.